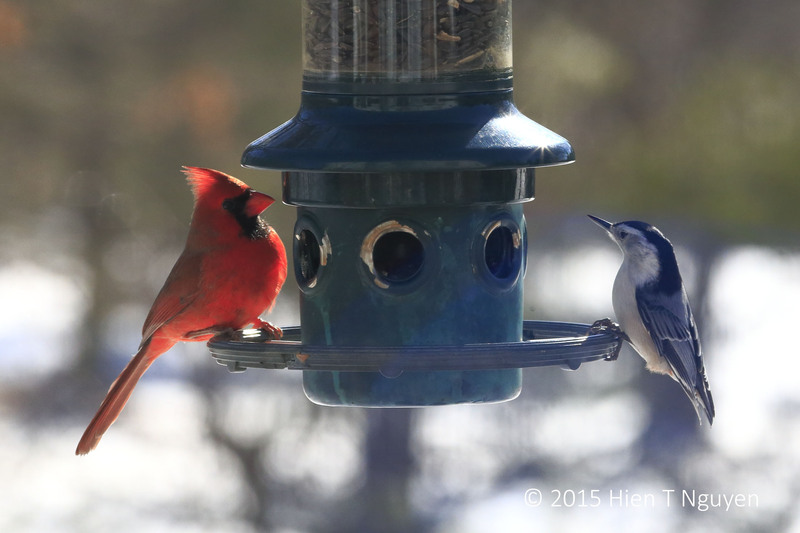 A Nuthatch and Cardinal were perched on our bird feeder. The Nuthatch made many trips, each time flying away with a sunflower seed. Next a Downy Woodpecker did the same thing, under the benign eyes of His Eminence. 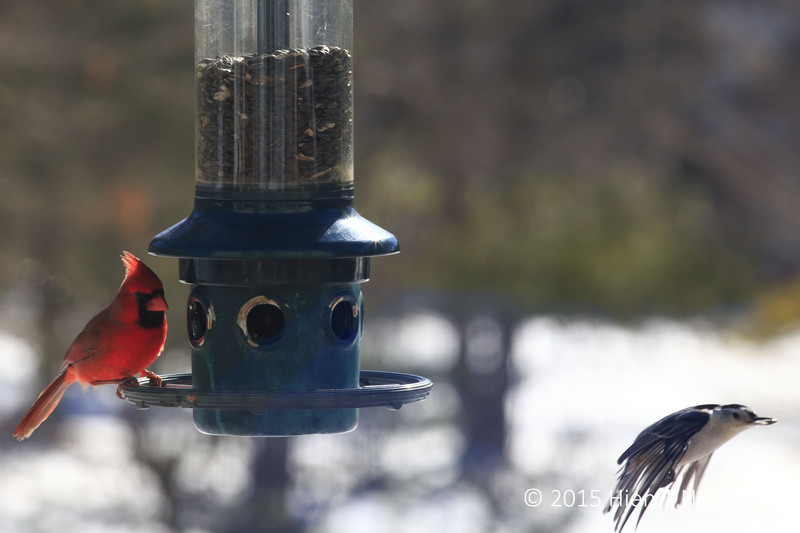 A Red-Bellied Woodpecker displaced the Cardinal, but that did not seem to bother the Air Woodpecker pilot. 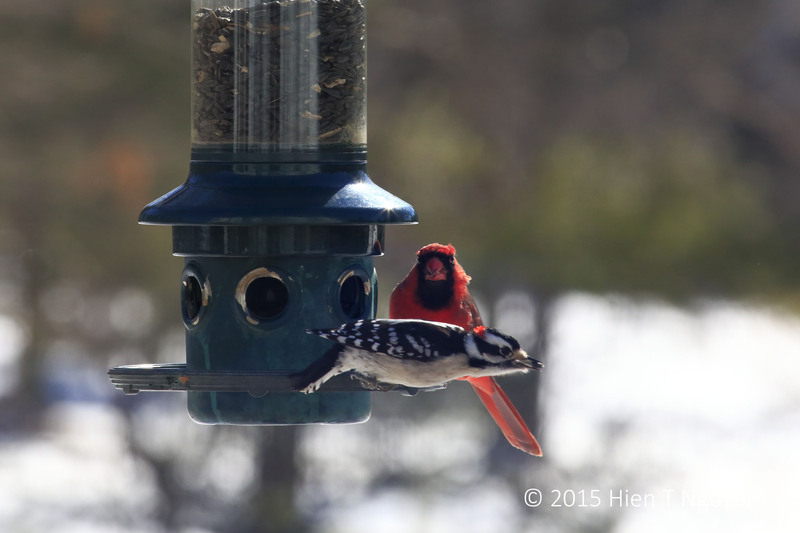 Your bird feeder is the best! Next to your camera, I mean. Tiny, I had to take many many shots to come up with these. But you probably have to endure the same, or maybe not? 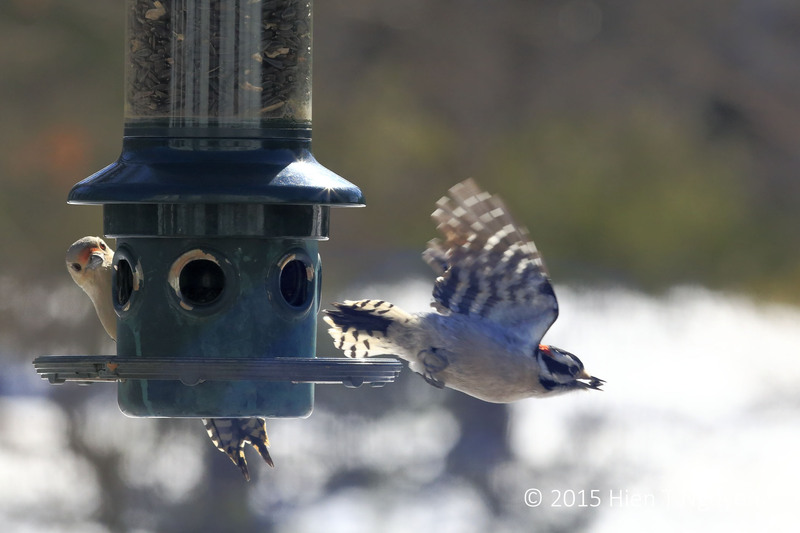 Great shots of the activity around your feeder. [grin] Glad I don’t, in truth, Hien. This is such a great series…the cardinal is one of my favorite birds, part because I have only seen a few in my life time. The color and awesome tuft of feathers at the top of its head! Beautiful ~ in my home town, we get to watch quail, which is another one of those unique & beautiful birds. The cardinal is so brilliantly red that my eyes are always drawn to it when it makes its appearance. There are at least 5 or 6 of them that come to the feeder every day, unless hawks hover nearby. Thanks for visiting and commenting. Me too ~ and I always wonder why people don’t celebrate wildly when seeing one 🙂 When I see the California Quail or Ring-Necked Pheasants that are common where I am from, like you I am always excited and drawn to them. I think I’ve seen a Ring-Necked Pheasant once, very fleetingly. Next time, I’ll try to take a photo. They may be the most gallant bird in nature ~ really incredible. What a great picture – two in one!! Amazing captures again! Quite the group visits at the bird feeder! Thanks Sue! I think the birds can’t find other things to eat because of the snow covering the ground, so they are converging on our bird feeder.